The planter makes a groove in the soil and drops in a seed. Each seed is dropped an equal distance from the last one. The seed is covered by the dirt pushed forward and pressed down by the blades and wheel at the back of the planter. Introduced in 1828, this type of seed planter replaced hand planting of row crops. 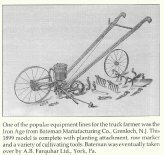 By the 1850s grain drills, which could plant many rows at a time, became more common. Planting crops in rows was done by hand since cultivation began. 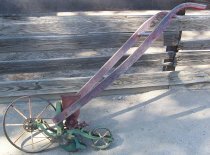 This slow, bending work changed in 1828 with the invention of a human-powered, wheelbarrow-style seeding device is designed for "any kind of seeds, and any number of them at a time, and at any required distance, as fast as a man can walk up to 10 acres a day!" (Patented on August 13, 1828, by Austin & Levi Robbins). In 1850 the grain drill was introduced which can plant crops far faster. The single row planter is still used for garden planting. This single row planter is pushed through the ground by the farmer. As the front wheel rotates, a chain delivers power to a gear. This turns a shaft which agitates the seeds in the container and, on the other side of the container, turns a disk which trips the seed release lever. This drops the seeds down a tube behind the plow. The number of seeds per inch is controlled by the opening below the seed chamber. This is controlled by a cam which is located behind the seed chamber. It is set to "Parsn" (parsnip) now. The seed is covered by the two hands behind the plow and pressed down by the back wheel.